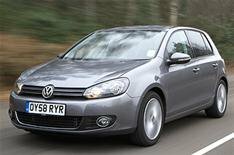 Volkswagen scrappage deals | What Car? Volkswagen is supporting the scrappage scheme. That brings the price of the Fox city car down to 4845 for anyone with a suitable car to trade in. The Polo starts at 6345, and the Golf costs from 11,585. In addition to scrappage, theres a further 350 off Polo Match and 375 off Polo SE models, and big reductions on the Golf: a total 3,250 off the Golf S (from 10,335) and 3,950 off the Golf S 1.6 TDI (from 11,355).